A tape drive is a data storage device that reads and writes data on a magnetic tape. Magnetic tape data storage is typically used for offline, archival data storage. Tape media generally has a favorable unit cost and a long archival stability. A tape drive provides sequential access storage, unlike a hard disk drive, which provides direct access storage. A disk drive can move to any position on the disk in a few milliseconds, but a tape drive must physically wind tape between reels to read any one particular piece of data. As a result, tape drives have very slow average seek times to data. However, tape drives can stream data very quickly off tapes once they've hit the right position. For example, as of 2010 Linear Tape-Open (LTO) supported continuous data transfer rates of up to 140 MB/s, comparable to hard disk drives. An external QIC tape drive. Magnetic tape drives were first used for data storage on mainframe computers in the 1950s, with capacities less than one megabyte. As technology advanced, capacities increased to 10 terabytes or higher of uncompressed data per cartridge as of 2014. In early computer systems, magnetic tape might be the main storage medium; although the drives were expensive, the tapes were inexpensive. Some computer systems ran the operating system on tape drives such as the DECtape drive; DECtape had fixed-size indexed blocks that could be rewritten without disturbing other blocks, so DECtape could be used like a slow disk drive. As some data can be compressed to a smaller size than the files on hard disk, it has become commonplace when marketing tape drives to state the capacity with the assumption of a 2:1 compression ratio; thus a tape with a capacity of 80 GB would be sold as "80/160". The true storage capacity is also known as the native capacity or the raw capacity. IBM and Sony have also used higher compression ratios in their marketing materials. The compression ratio actually achievable depends on the data being compressed. Some data has little redundancy; large video files, for example, already use compression technology and cannot be compressed further. A sparse database, on the other hand, may allow compression ratios better than 10:1. Tape drives can be connected to a computer with SCSI (most common), Fibre Channel, SATA, USB, FireWire, FICON, or other interfaces. Tape drives are used with autoloaders and tape libraries which automatically load, unload, and store multiple tapes, increasing the volume of data which can be stored without manual intervention. In the early days of home computing, floppy and hard disk drives were very expensive. Many computers had an interface to store data via an audio tape recorder, typically on Compact Cassettes. 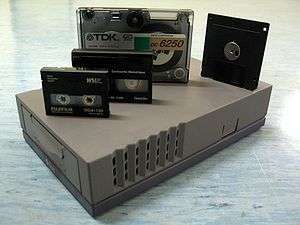 Simple dedicated tape drives, such as the professional DECtape and the home ZX Microdrive and Rotronics Wafadrive, were also designed for inexpensive data storage. However, the drop in disk drive prices made such alternatives obsolete. A disadvantageous effect termed "shoe-shining" occurs during read/write if the data transfer rate falls below the minimum threshold at which the tape drive heads were designed to transfer data to or from a continuously running tape. In this situation, the modern fast-running tape drive is unable to stop the tape instantly. Instead, the drive must decelerate and stop the tape, rewind it a short distance, restart it, position back to the point at which streaming stopped and then resume the operation. If the condition repeats, the resulting back-and-forth tape motion resembles that of shining shoes with a cloth. Shoe-shining decreases the attainable data transfer rate, drive and tape life, and tape capacity. In early tape drives, non-continuous data transfer was normal and unavoidable. Computer processing power and amounts of available memory were usually insufficient to provide a constant stream, so tape drives were typically designed for so called start-stop operation. Early drives used very large spools, which necessarily had high inertia and did not start and stop moving easily. To provide high start, stop, and seeking performance, several feet of loose tape was played out and pulled by a suction fan down into two deep open channels on either side of the tape head and capstans. The long thin loops of tape hanging in these vacuum columns had far less inertia than the two reels and could be rapidly started, stopped and repositioned. The large reels would occasionally move to take up written tape and play out more blank tape into the vacuum columns. Some modern designs are still developed to operate in a non-linear fashion. IBM's 3xxx formats are designed to keep the tape moving irrespective of the data buffer—segments are written when data is available, but gaps are written when buffers run empty. When the drive detects an idle period, it re-reads the fragmented segments into a buffer and writes them back over the fragmented sections—a 'virtual backhitch'. Later, most tape drives of the 1980s introduced the use of an internal data buffer to somewhat reduce start-stop situations. These drives are often referred to as tape streamers. The tape was stopped only when the buffer contained no data to be written, or when it was full of data during reading. As faster tape drives became available, despite being buffered, the drives started to suffer from the shoe-shining sequence of stop, rewind, start. Most recently, drives no longer operate at a single fixed linear speed, but have several speeds. Internally, they implement algorithms that dynamically match the tape speed level to the computer's data rate. Example speed levels could be 50 percent, 75 percent and 100 percent of full speed. A computer that streams data slower than the lowest speed level (e.g. at 49 percent) will still cause shoe-shining. Magnetic tape is commonly housed in a casing known as a cassette or cartridge—for example, the 4-track cartridge and the compact cassette. The cassette contains magnetic tape to provide different audio content using the same player. The outer shell, made of plastic, sometimes with metal plates and parts, permits ease of handling of the fragile tape, making it far more convenient and robust than having spools of exposed tape. Simple analog Compact Cassette audio tape recorders were commonly used for data storage and distribution on home computers at a time when floppy disk drives were very expensive. The Commodore Datasette was a dedicated data version using the same media. 1958 IBM 729 Separate read/write heads providing transparent read-after-write verification. As of January 2009, the Computer History Museum in Mountain View, California has working IBM 729 tape drives attached to its working IBM 1401 system. 1984 IBM 3480 200 MB Internal takeup reel with automatic tape takeup mechanism. Manufacturers often specify the capacity of tapes using data compression techniques; compressibility varies for different data (commonly 2:1 to 8:1), and the specified capacity may not be attained for some types of real data. As of 2014 tape drive technologies capable of higher capacity were still being developed. In 2011, Fujifilm and IBM announced that they had been able to record 29.5 billion bits per square inch with magnetic tape media developed using the BaFe particles and nanotechnologies, allowing drives with true (uncompressed) tape capacity of 35 TB. The technology was not expected to be commercially available for at least a decade. In 2014, Sony and IBM announced that they had been able to record 148 gigabits per square inch with magnetic tape media developed using a new vacuum thin-film forming technology able to form extremely fine crystal particles, allowing true tape capacity of 185 TB. ↑ Historical interfaces include also ESCON, parallel port, IDE, Pertec. ↑ Mellor, Chris (2005-03-02). "Mainframe tape lock-in ended". TechWorld. ↑ "Internet Archive Wayback Machine" (PDF). Web.archive.org. 2011-01-07. Archived from the original (PDF) on October 12, 2008. Retrieved 2012-01-31. ↑ "1401Restoration-CHM". Web.archive.org. 2011-05-14. Archived from the original on May 14, 2011. Retrieved 2012-01-31. ↑ Crandall, Daryl (April 30, 1990). "Another summary of 1/4" tape systems". Sun Managers Mailing List. Retrieved 2013-04-21. 1 2 "IBM Archives: Fifty years of storage innovation". 03.ibm.com. Retrieved 2012-01-31. ↑ "Capstanless magnetic tape drive with electronic equivalent to length of tape - Cipher Data Products, Inc". Freepatentsonline.com. 1985-02-19. Retrieved 2012-01-31. 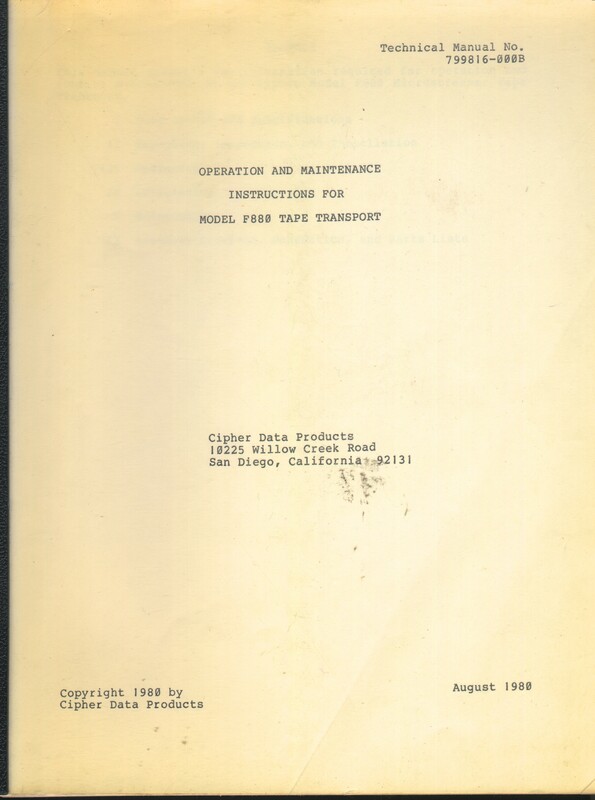 ↑ "Operation and Maintenance Instructions for Model F880 Tape Transport". Archived from the original on September 22, 2007. Retrieved 2012-01-31. ↑ "IBM 3480 magnetic tape subsystem". 03.ibm.com. Retrieved 2013-04-19. ↑ "DECsystem 5100 Maintenance Guide" (PDF). August 1990. Retrieved 2012-01-31. ↑ "3480 & 3490 tape backup migration". advanced downloading ltd. Retrieved 2013-04-19. ↑ "Tape". Alumnus.caltech.edu. Retrieved 2012-01-31. ↑ "Hard-disk-drive technology flat heads for linear tape recording". Web.archive.org. Archived from the original on February 16, 2008. Retrieved 2012-01-31. ↑ "Data retrieval - Hewlett-Packard Development Company, L.P". Freepatentsonline.com. Retrieved 2012-01-31. ↑ "Tape Wars: Is The End Near? - tape drives - Industry Trend or Event - page 2 | Computer Technology Review". Findarticles.com. Retrieved 2012-01-31. ↑ "STK Tape Drive Products and Technology" (PDF). Retrieved 2012-01-31. ↑ "FujiFilm Barium-Ferrite Magnetic Tape Establishes World Record in Data Density: 29.5 Billion Bits per Square Inch". Fujifilm. January 22, 2010. Retrieved 2011-07-13. ↑ Harris, Robin (January 24, 2010). "A 70 TB tape cartridge: too much, too late?". ZDNet. Retrieved 2011-07-13. ↑ "Sony develops magnetic tape technology with the world's highest*1 areal recording density of 148 Gb/in2". Sony Global. Retrieved 2014-05-04. ↑ Fingas, Jon (May 4, 2014). "Sony's 185TB data tape puts your hard drive to shame". Engadget. Retrieved 2014-05-04.